Bitfinex is a long-standing crypto broker that provides a wide array of crypto assets and order types across its regulated entities, while its high minimum makes it geared more towards pro traders. Founded in 2012, Bitfinex is one of the oldest crypto brokers, with its headquarters in Hong Kong. The company accounts for a significant amount of global daily crypto volumes in markets such as Bitcoin. The Bitfinex brand provides margin trading and lending (not available to US citizens) across 263 crypto assets, including crypto-to-crypto pairs as well as crypto-to-fiat pairs, through its BVI entity, iFinex Inc.
Bitfinex maintains registration as a Money Service Business in 57 US states and foreign territories from its Taiwan-based entity, BFXNA Inc. Bitfinex catered to US persons (excluding New York and Washington State residents) through its BFXNA Inc. entity, whereas non-US clients deal with its BFXWW Inc. entity. However, as of August 15, 2018, the broker decided to stop serving individual US and corporate customers, limiting its services in the US to institutions that hold more than $10 m in assets, which makes them qualify as Eligible Contract Participants (ECPs). The popular stablecoin, tether, is also linked to Bitfinex in terms of common ownership between related entities. Bitfinex also provides an OTC desk for institutional traders moving large amounts of crypto. The broker announced its plans to become an EOS Block producer, under the name EOSfinex, using its BVI-based entity and with servers in Zug, Switzerland, where it plans to relocate. To help investors select a trustworthy exchange, we have created a proprietary 1-100 score (the higher the better) of overall trustworthiness, which we call the Trust Score. Here is our trust summary for Bitfinex. The following table summarizes the different investment products available to Bitfinex clients. The commission fee for crypto trading at Bitfinex generally ranges from 0.1% for makers (those posting orders) to 0.2% takers (those whose orders match with an existing maker order). For those who have traded more than $500,000 worth of crypto in the last 30 days, the maker fees are reduced to 0.08%, and further discount tiers kick-in at higher volume thresholds and eventually fees reach zero once $7.5 m is reached in trailing 30-day volume. The taker fees are reduced from 0.2% to 0.18% once the 30-day volume reaches $10 m, and can drop as low as 0.1% when the trailing 30-day volume reaches $30 m or more. Bitfinex’s fee schedule will suit the needs of highly active crypto traders, and its lower-tier fees are also competitive compared to its peers. As part of its security strategy, Bitfinex states that it holds approximately 99.5% of its users’ funds in cold storage offline, using a multi-signature scheme that requires at least four out of seven of its Hardware Security Modules (HSMs) held by its management team, who are globally distributed. The broker maintains just 0.5% in its hot wallet or only the amount needed to process withdrawals that are in its queue, and the hot wallet also requires a four-of-seven authentication from management to be refilled with funds from its cold storage wallet. The broker also migrated to a new data server and has performed a complete audit of its source code and entire stack, in addition to DDoS protection and encrypted connections with HTTPS TLS version 1.3. Penetration testing has been performed by Hackative Security, and the broker maintains daily automatically encrypted backups to multiple off-site locations. Bitfinex supports Two Factor Authentication (2FA) primarily from Google Authenticator and Twilio, and users can whitelist an IP address. The broker also offers a Tor domain for onion routing logins. Security mechanisms, such as locking withdrawals for 24-hours when a new IP address is used, helps to minimize the chances of hackers gaining access to traders’ accounts in the event that their login credentials have been obtained from their devices or person. Bitfinex also offers users the ability to set a passphrase (secret word) when performing withdrawals, to deter potential compromises such as from malware or other meet-in-the-middle (MIM) attacks. The broker also implements an automated suspicious activity detection system to freeze users’ accounts to prevent potential fraud in the case of a possible breach of users’ own data. Bitfinex has taken many prudent steps to strengthen its security and that of its users with the addition of Universal 2nd Factor (U2F) devices. Bitfinex provides a web-based trading platform that supports the latest web standards, with a responsive HTML5-based layout and simple user interface. The Bitfinex platform supports multiple order types, including one-cancels-the-other (OCO), as well as hidden order types designed not to show up in the order book, as well as trailing stop orders, fill-or-kill (FOK) and scaled orders. Favorites can quickly be added from the watch list and users can click on the favorites to show only pairs that have been favorited for quick grouping. 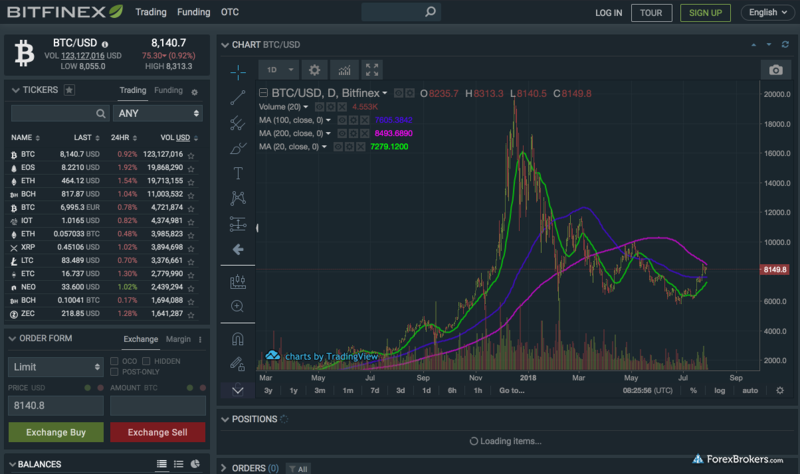 Charts are front and center in the main window in the Bitfinex platform and come powered by TradingView, which packs a comprehensive suite of 73 drawing tools, including 368 icons and 78 studies. One neat feature in the order books is the ability to add alerts on a specific price level from directly within the book, which is very useful for those who are watching various levels to determine optimal entry/exit or other price analysis. Bitfinex provides a separate wallet for each of its platform features, including Exchange Trading, Margin Trading, and Margin Funding. Overall, the Bitfinex web platform ranks highly amongst crypto brokers and is near the top when it comes to the array of simple and advanced order types. The Bitfinex mobile app is available for iOS and Android devices. The app has a very simple layout with four main sections, including the Trading, Funding, Transfer, and Account modules that can be accessed from the tabs on a lower navigation bar. 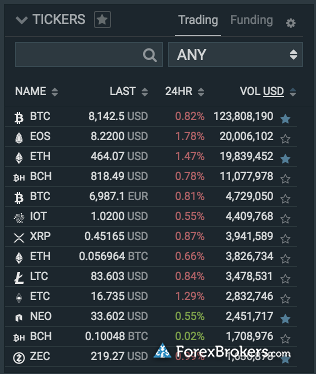 When you hit the menu button from the trading screen to display the rates of supported crypto asset pairs, the page doesn’t fully reveal itself, as the window showing the book prices remains in partial view. While this appears to be done to keep traders focused on being able to quickly trade and switch between pairs, some might find it a limitation if they want to spend more time scrolling through crypto assets. In addition, I did not see the favorites icons, which were visible in the web app. 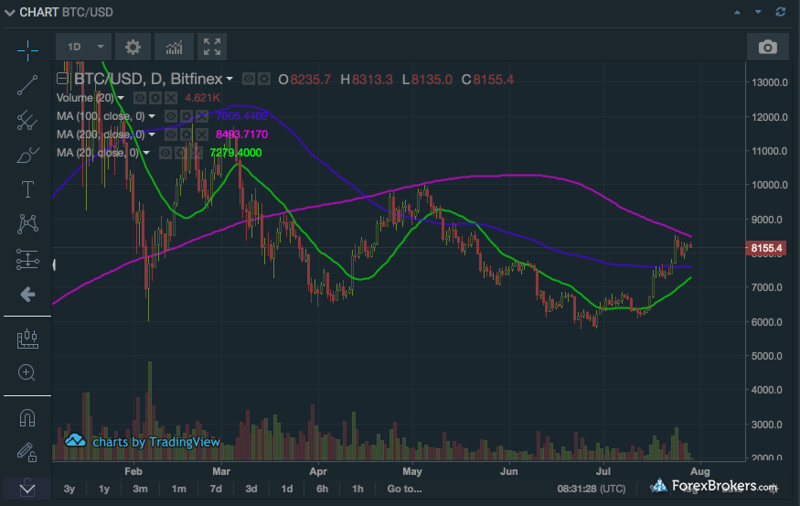 Like its web counterpart, the Bitfinex mobile app has charts powered by TradingView, and comes with a wide range of nearly 80 technical studies. It’s also worth noting that API keys can be used with the mobile app for either read-only or read and write (full trading), which is a nice advanced feature for those trading via API. The Bitfinex mobile app has a good foundation for a crypto trading application, thanks to its ease of use and advanced charting, while its watch list has room for improvement. Adding research data to the app would further boost its ranking. Through its financing order book, Bitfinex enables users to obtain up to 3.3 leverage (33% margin) by borrowing from other peers on the margin trading platform after choosing the interest rate and duration for a given loan size. Comparable to crypto brokers offering margin-based lending, Bitfinex users who act as lenders can earn interest by staking their fiat or crypto for borrowers to use in the margin funding platform. This feature allows users to also open short positions up to a maximum of 70% of the bitcoins sold short. Ethfinex, an independent spinoff from Bitfinex, is being developed so that Bitfinex users can login with their existing account credentials to access ethereum-related resources including ERC-20 tokens, although this functionality has not yet fully launched. Bitfinex also provides an over-the-counter (OTC) trading desk for larger trades, for which a 0.1% fee is charged on both sides of each trade. Bitfinex is home to some of the largest trading volumes in major crypto currencies, such as bitcoin and tether. While the broker might not cater to traders on a tight budget due to its steep minimum account requirement of $10,000, Bitfinex is the top choice for many professionals who demand access to deep liquidity and competitive commission rates from a regulated broker, as well as active trader commission discounts. Finally, the broker’s decision to stop serving individual and corporate US customers will limit the broker’s reach in North America. Select one or more of these brokers to compare against Bitfinex. Find out how Bitfinex stacks up against other brokers.